Last december, opera talent Amira Willighagen won the finals of Holland’s Got Talent as well as a trip to Las Vegas. Due to album-recordings and her performances in South-Africa, she didn’t have the time yet, but coming week it’s finally going to happen: Amira goes Vegas! She’ll be leaving coming Saturday, together with her family. On Sunday there will be a sound check down at Planet Hollywood, where Amira will shine in V – The Ultimate Variety Show, coming Wednesday April 30th at 8:30pm PDT. Besides the performance, Amira and her family will have plenty of time to enjoy their holiday, for example at the pool of the hotel, or by taking a safari tour. What the agenda for the rest of the coming week will look like, is yet unknown. Amira has her Golden Record! 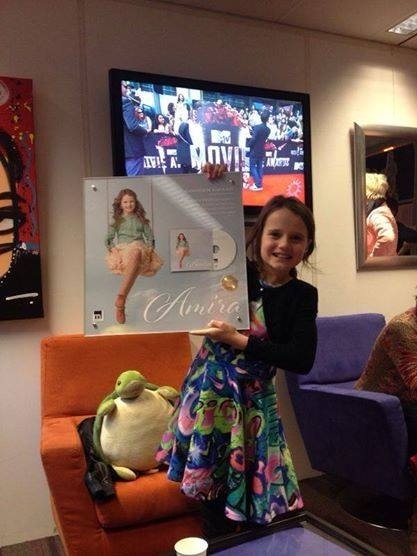 Not even 3 weeks after her album Amira has hit the shops, Amira Willighagen already received her first Golden Record. An artist receives this award if an album of the Classical genre sells 10.000 times. The 10-year-old opera singer received her Golden Record yesterday, out of the hands of TV-personality Albert Verlinde during the TV-program RTL Boulevard. Amira is very proud, but also a bit surprised as she didn’t expect her album to be selling that well already. For us the upcoming Golden Record wasn’t really a surprise. After the first week since its release, Amira’s album immediately took the lead in the Dutch Album Top 100, which also makes her the youngest artist to ever take the #1 position in this chart. Not even two weeks after the release of 10-year-old opera talent Amira Willighagen’s debute album Amira, the Gold status for this album has been requested to the NVPI, the Dutch sector oganization for the record and movie industry. If this status will be acknowledged or when the golden record (CD) will be presented, is unknown. In the Netherlands, albums in the category Classical reach the Gold status when 10.000 copies have been sold. This includes CD sales as well as paid downloads of the full album. If an album reaches a certain status, is not only determined by the sales numbers. In the end the record company decides if and when an application will be filed for a certain status, and which status this will be. At this moment a request to aknlowledge the Platinum status to Amira’s album has not been applied. AmiraFans now also in English! Starting today AmiraFans is also available in English. This way, we meet the needs of the growing number of visitors from outside the Netherlands. Besides the Google Translate-widget (which still provides for an automated, yet very basic translation) has the entire website been translated into English. New messages will be published in Dutch as well as English. Of course we also wish our English speaking fans a pleasant stay on our web site!